I welcome the contrition shown by Dundee City Council Chief Executive and Executive Director of Neighbourhood Services with regard to the problems with bins over the summer but it has to be pointed out that the policy had been decided by councillors not by officers. Officers of the council have been trying to implement the policy voted through by SNP, Conservative and Liberal Democrat councillors in the face of opposition to the proposals from Labour and the sole independent councillor Ian Borthwick. When the decisions were made, in June 2016, which implemented the latest chaotic round of recycling changes the Labour Group put forward an amendment to ensure that there was 'meaningful consultation' with the people of Dundee. On Monday evening we heard that officers are now willing to listen to concerns from people. Surely, this is a case of shutting the stable door after the horse has bolted. I believe that if a meaningful consultation had been held prior to the implementation of the changes then some of the problems that have been experienced could have been avoided. Why was the council frightened to listen to the people of Dundee? I was surprised to see officers accept the blame for decisions. Officers do not make policy for Dundee City Council. It was a welcome show of humility from senior officers but it would have been more appropriate for the political leadership to issue the apology, but as the Courier has pointed out 'sorry' does seem to be the hardest word to say. I recognise that the Leader of the Council has said that he will fix the problem. Let's hope that he is true to his word. Perhaps the most disappointing thing about Monday night was that there is unanimity on the council in favour of promoting recycling. Dundee used to be known for its recycling - it was an early adopter of recycling under Labour leadership. The Labour Group wants Dundee to be at the forefront of recycling and we want to work with the Administration to achieve this but our past attempts to assist them have been ignored. We hope for better in the future. At Monday evening's Community Safety and Public Protection Committee there was an update on Air Quality reported to the committee. Unfortunately, there are still areas of the city where the air quality remains poor including Lochee Road in the West End ward. At the meeting on Monday evening my ward colleague Bailie Fraser Macpherson spoke on the issue. I made the point that I could have also spoken at some length about the lack of changes in air quality in the Lochee Road area over a number of years and that I did not want to return to the committee next year to make the same points. We need action. As a group, the Labour Group is happy to work to allow the council to fulfil the SNP Scottish Government's ambition set out in their policy document Clean Air for Scotland - The Road to a Healthier Future. My colleague Councillor Michael Marra put forward an amendment to the report which was put forward by the Administration. The amendment asked the council to look at the process and implications for Dundee becoming a Low Emission Zone. A Low Emission Zone is a policy brought forward by the Scottish Government which would limit polluting vehicles in the city for example. I was really pleased when the Convener agreed to accept Councillor Marra's amendment. If we are to make the changes that are needed we must work with haulage and courier companies to ensure that they are prepared for the changes that will surely come in order to improve air quality. We also need to look at ensuring that public transport makes a contribution to improving air quality. For example, hybrid buses which have been supported by government funding should be directed to those streets where they will make the most difference to air quality. We must take air quality seriously. This is why the we must do all that we can to support the work done through the publication of the Cleaner Air for Scotland – The Road to a Healthier Future. If we are to meet our target of full compliance with EU air quality regulation by 2020 then there needs to be a step change in our actions. Also as a city committed to promoting fairness we need to look at who suffers most from poor air quality. It is the poor and those with already existing health conditions who suffer most from poor air quality. That is unacceptable. I think that we need to do more to ensure that this is taken seriously. I think that we need to be at the forefront of supporting the environment. 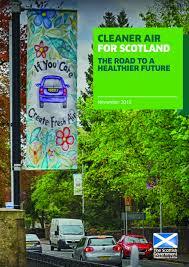 On this important issue I am happy to help the Scottish Government achieve their ambitious targets. That is why I think that our city should look to be one of the first with a Low Emission Zone. As a UNESCO City of Design we should want to be at the forefront of designing a city with low emissions. It is good that the council worked together to try and tackle poor air quality. I look forward to further reports and to making real progress on improving air quality across Dundee.